When you are trying to operate a business, getting caught up in procrastination can cost you. There are a number of things that you can lose out on if you procrastinate for too long. You might find that your profits take a nose dive while you procrastinate about various business decisions. As a business owner or CEO you don’t get the luxury of procrastinating for too long. If you don’t get that loan application in on time, or you don’t hire that tax accountant in time, there could be serious consequences to those delayed decisions. 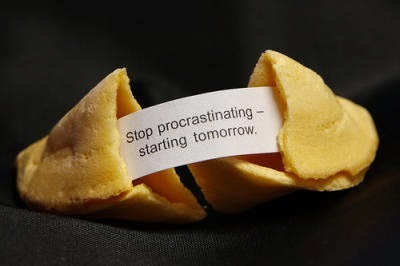 There are so many reasons that someone might procrastinate, and every one of them has been used countless times by someone telling themselves, it’s not a problem. The most common reason for procrastination is that the person doing it feels that they have too many other important tasks to complete to dedicate time to just one task. They may tell themselves this while they take time to dawdle and flit from one small project to another, then when crunch time arrives, they could kick themselves for not concentrating on the main priority first. This person needs to concentrate on one thing at a time. The most important things need to be done first, then, if there is time left, tackle the smaller less important items on the list. Many times people will just feel overwhelmed with a project or task and put off starting it because they just feel it is too involved for them to complete. These people should break the project up into bite sized pieces and take care of each one until they are all completed. If being overwhelmed is an issue, they may want to talk to the person who gave them the task and see if they could assign it to someone else. If you happen to be in charge and need to complete the project yourself, then you will need to do it one small piece at a time until it is finished. If you can’t do this, either delegate it or hire someone who can do it for you. While someone may put off a project related task, it may be because something else is required to be done first. This type of procrastination can be caused by poor planning in the beginning of a project. If this seems to be the problem, then go back to the planning stage and set attainable tasks for the people involved. You can also assign different pieces of the project to more people so the tasks get done quicker and are less stressful on each person. Nearly every business in the world suffers from procrastination at some point in time. There seems to be very different views on procrastination among various business types and while some businesses see it as a form of creativity, many effects of procrastination can be viewed as negative, and can be measured simply by looking at the end results. When everyday tasks are not being completed on time, something has broken down in the process somewhere. When you examine the evidence, it usually ends up being that someone in the process has gotten distracted or feels overwhelmed. Procrastination doesn’t necessarily have to be about laziness, but is often seen like this. Some people put things off for very specific reasons but take too long to get back to them. If this happens too often it can be a serious problem for business. Many of the biggest problems come when a owner will put off paying bills or doing taxes because they are not familiar with the process. Then when they do hire that person is sitting behind the 8 ball and it takes them quite a while to get caught up which can end up costing the company more in late fees and penalties. It's best to get help as soon as possible. Yes AJ, these are just some of the issues of procrastination that can cost business dearly. I am one to procrastinate often, and my work hurts because of this. The best way I found that works is to simply schedule time better instead of doing work when it comes in. Once you have a working schedule and actually go with it, then you'll get pretty far. Amy, I think there is a little procrastination in everyone, so don't get too concerned. You appear to have recognised this and done something about it, which is excellent. A lot of people find that attending a Time Management course is often useful, as when practised properly, focuses the mnd on the difference between was is Urgent and what is important. Getting over procrastination is difficult but if we are going to be successful in any type of business, procrastination cannot be in our vocabulary.